How to make a clothespin dragonfly with delicate, gossamer wings. This dragonfly model is easily made, with the main supplies being a clothes pin, paint, and a some wire to use as the stand. You will also need tulle netting to make the wings – but please note: to make your dragonfly model more realistic, make two pairs of wings, and fasten the second pair behind the front ones. Dragonflies always have two pairs of wings, so the picture of our model is, sadly, missing some flying power. Black tulle or you can even use black ribbon. Distribution, diversity, indentification and photos of dragonfly species around the world. Working to conserve dragonflies and their wetland habitats. 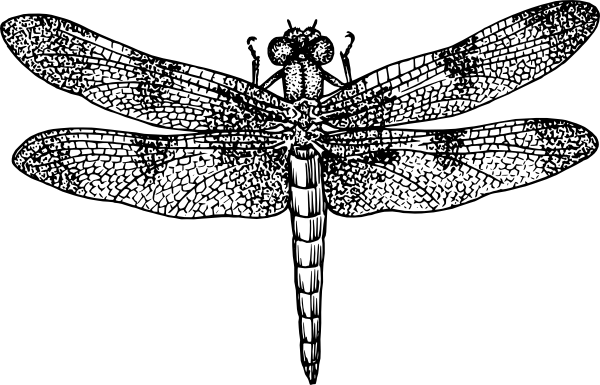 Definition, description, photos and historical significance of dragonflies. To make this dragonfly model, I looked at pictures on the net to decide on a color. I chose blue, but if you research dragonflies, you’ll find they appear in almost any color. First, make a hole in the bottom center of the clothes pin. You can do this with a small drill, if you have one, or you could make a hole by hammering in a small nail just a little, then removing it to leave the hole behind. Paint the clothespin in the color you have chosen, then set it aside to dry. Now you can make your wings. Cut two strips of tulle, each two by six inches, then lay the two pieces on top of each other. Scrunch the tulle in the middle and twist the black pipe cleaner around the center. If you don’t have any tulle, you can use some black wire-edged ribbon and make a four loop bow and twist the pipe cleaner in the center of the bow. Our model picture appears to have only one pair of wings, but you should have two pairs of wings on your dragonfly, one pair being mounted in front of the other pair. When the paint is dry, paint on black strips, about a 1/2 inch from the tail, ending at a 1/2 inch away from the head. Where the 1/2 stripe is before you get to the head, I painted swiggle lines going the opposite way, other then the striping going up the body. Then when the lines are dry, I just highlighted the black strips to give it some character, with some moss green. Look at some dragonfly pictures to inspire your paint markings. 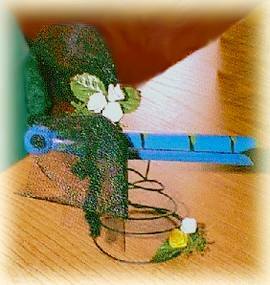 Attach the wings by twisting the pipe cleaner around the clothespin, securing with a little glue on the bottom. Leave some of the pipe cleaner hanging down so that you can bend it to make legs. Glue small pompoms on each side of the round part of the clothes pin to make the eyes. Take a piece of wire and make a circle. Keeping twisting the wire in smaller and smaller circles, like a spring that gets smaller toward the top. Bend the top end of the wire straight up then glue it into the hole that you have put in the clothes pin. Add some moss in the middle of the dragonfly wings, along with some leaves and tiny ribbon roses. You can also put a small selection of greenery and flowers at the bottom of the base – or you can omit these additions entirely.